Stephen Roper is best known for ‘Back Stage – A Book Of Reflections’, a comprehensive account of GARY NUMAN’s imperial years between 1979 – 1981. The book featured contributions from GARY NUMAN himself and others who were there like band members Chris Payne, RRussell Bell and the late Cedric Sharpley, plus support acts OMD, SIMPLE MINDS and the sadly departed NASH THE SLASH. ‘Back Stage’ was a remarkable achievement for an independent publication. On seeing the hardback edition, GARY NUMAN said: “That’s why I enjoyed reading this book so much. It gives a voice to so many people that were vitally important to me, and to what happened to me, in those early days. I was grateful to them then, and I remain grateful to them now”. More recently, Roper has ventured into gig promotion, hosting a successful live appearance by former KRAFTWERK member WOLFGANG FLÜR, supported by Glasgow combo ANALOG ANGEL at Norwich Epic Studios in June 2015. 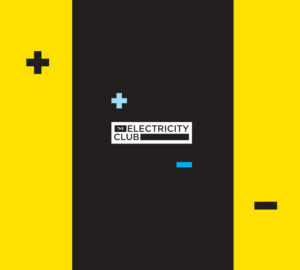 And now, he has joined forces with The Electricity Club to present TEC004. 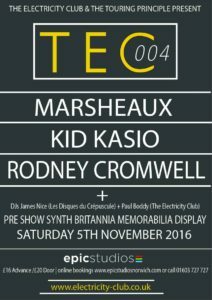 Returning to Epic Studios, the event will take place on SATURDAY 5th NOVEMBER 2016 and feature MARSHEAUX, KID KASIO and RODNEY CROMWELL. With a pre-show memorabilia celebrating the legacy of Synth Britannia, it promises to be an essential day out in the East Anglian cathedral city. Your book ‘Back Stage’ was a very well received artefact within the GARY NUMAN fan community? Yes, it was mainly because it covers Gary’s rise to becoming one of the world’s biggest stars. And rather than me writing my take on it, it’s told by the people who were there. Part of it answers many questions which always had fans wondering what really happened. Who were your favourite interviews in the book? That’s a hard one as they were all fantastic. There’s a great story of when Jim Kerr rang me at work and asked if we could do the interview now, and I had to say no. He then rang me back later that night and asked if it was ok then. Yet again it wasn’t, but we did it later and he really is a fantastic guy. My favourite has to be Chris Payne or was it NASH THE SLASH or Andy McCluskey? All had me falling off my chair laughing… but all joking aside, everyone was brilliant and I made some very good friends. Cedric was believe it or not, the hardest person to get hold of and became a very good friend in the short time I knew him. He remembered everything in great detail, the biggest problem we had was that we would tail-off in different directions and talk for hours about many things apart from the book. And I can honestly say he never had a bad word to say about anyone, a true gentleman. And he would have loved to have worked with Gary again, even though some have said different… this was a question I asked him and as always, he didn’t have a bad word to say about Gary. Gary did ask me about this and was pleased to hear that Cedric had no hard feelings towards him. GARY NUMAN actually contributed to the book, what did the man himself think of the finished product? Funny quick story, I was showing Gary a rough copy of ‘Back Stage’ with some stage design plans and his eyes lit up and he started just talking about them, really remembering everything… so I said “see your memory isn’t that bad”, to which he gave me a strange look, then just laughed! You’ve gone towards the e-Book route for the book’s second edition. How do you feel about this brave new world of digital with music, books and magazine? It’s a strange one, but we have to keep up with the times and the good thing with the digital age is that it’s instant and you can add so much more at no cost. With the e-Book version of ‘Back Stage’, I’ve been able to add hundreds more photos in colour which I couldn’t add to the hardback version because of the costs. Postage outside of the UK to say, the USA, was over £13 whereas the e-Book has no postage cost… so yep I’m all for it. The rise of digital could almost be a subject for a Numan lyric? Is a follow-up to ‘Back Stage’ covering Numan’s comeback ever likely? You spoke to Joe Hubbard and Andy Coughlan, both bassists in this era? You ran your first live event in June 2015 when you hosted WOLFGANG FLÜR and ANALOG ANGEL at Epic Studios. How was it for you? It was fantastic evening and nice to meet the legend that is WOLFGANG FLÜR. And seeing ANALOG ANGEL play live was the highlight of the night. There was a huge amount going on behind the scenes, which can only be put down to a comedy of errors… if Wolfgang’s UK people had bothered to read the contact, it would have never happened… but apart from that, it was a well turned-out event which I think everyone enjoyed, I know I did. The music business is a funny old game… what do you think you’d learnt from your experience? Be careful who you think your friends are!!! I’ve worked on about 4-5 Numan albums starting with ‘Living Ornaments 80’ (the 2005 remastered release) and helped out on ‘The Touring Principle’ and ‘Micromusic’ DVDs, plus NASH THE SLASH’s ‘Live in London’ 2008 CD, and then of course ‘Back Stage’. Some will bend over backwards to help and others feel that you owe them something. But all-in-all, I’ve learnt a lot and that there really are some nice decent people out there, more than happy to help. And if you can’t tell the difference there, then what chance is there of anything else being right? It’s a difficult one because if someone tells me there’s an electronic magazine or website, I’m thinking old-time stuff from the late 70s into the 80s, Moogs wall-to-wall synths etc… but if we are talking dance stuff, which OK has the synths on, then sorry I’ve no interest. 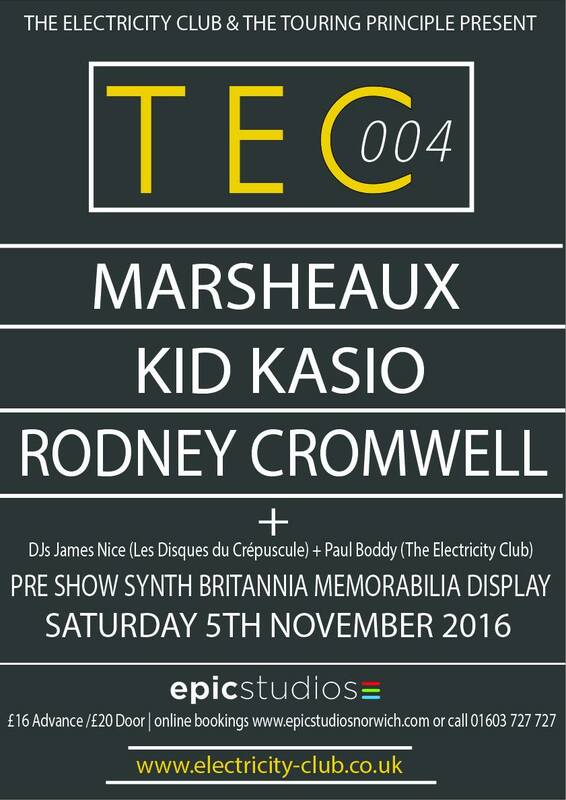 What will make TEC004 featuring MARSHEAUX, KID KASIO + RODNEY CROMWELL special? 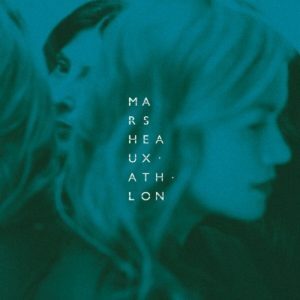 MARSHEAUX’s new album ‘Ath.Lon’ is without doubt, the best album I’ve heard since Numan’s ‘Telekon’, in that I’m loving every track on it which is a rare thing these days. Plus we have KID KASIO and RODNEY CROMWELL on the bill and not one, but two awesome DJ sets. So if all that doesn’t make for a special night of synthpop music, then I don’t know what would. I’ll be bringing a selection of GARY NUMAN Fan Club items from my own personal collection for the memorabilia display during the afternoon of TEC004. I hope people will find this stuff of interest, because it captures a fabulous moment in time when the synth music ruled the world.